There is a broad consensus that climate change presents the international community with a formidable challenge. Yet progress on all fronts - prevention, mitigation, and adaptiation, has been slow. If humanity really faces dire consequences, why has there been such reluctance and resistance to do anything about it? Nanda finds an explanation is the sharp divide between the developed and developing countries on how to act. Developing countries demand that major industrailized nations provide the necessary resources and technology to address climate change, while many developed countries seek firm commitments and timetables on action from the developing countries. The result is a statemate. 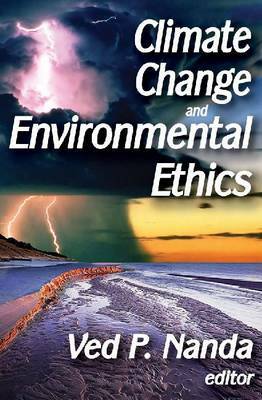 Climate Change and Environmental Ethics explores this question with first-rate research and thinking of scholars from multiple discipline es - ethics, ecology, philosophy, economics, political science, history, and international law. What distinguishes this collection from much recent work on climate change are two of its special features. One is the multi-disciplinary backgrounds of the scholars, their stellar experiences, and the wisdom with which they have expressed not simply their philosophy and theory but also their suggestions for concrete, specific action in practical terms. The second is the special niche this volume fills in its overarching theme of the need for a renewed environmental ethic that can bring together these disparate but interconnected views. This volume explores alternative ways of conceiving of our relation to the natural world. A spirit of international cooperation and collaboration is needed to meet the challenge, and this book makes a substantial contribution toward that goal. It will compel the reader to think anew about our understanding of the scientific and technical issues, as well as our values and ethical responsibilities regarding climate change. "The breadth and depth of the discourse to reconceptualize environmental ethics and change the human mind-set about moral responsibility are impressive and critical for developing the well-being of people everywhere, as well as for sustaining the future ecological resiliency of the Earth. These essays need a wide readership, particularly among government officials, environmental ethicists, and global policy makers... Highly recommended." "Climate Change and Environmental Ethics uses writings from scholars from different disciplines - ethics, ecology, economics and more - to explore issues inherent in climate change politics. There's a big divide between developed and developing countries on how to respond to climate change issues: Climate Change and Environmental Ethics offers a scholarly multi-disciplinary exploration of environmental ethics as a whole, and pairs this analysis with suggestions for concrete, specific actions." "The changing climate is pushing many Earth systems towards critical thresholds that will alter regional and global environmental balances and threaten stability at multiple scales. Alarmingly, we may have already passed tipping points that are irreversible within the time span of our current civilization." "Climate Change and Environmental Ethics collects well known authors from the humanities and social sciences to bring fresh insight and very important analysis of the present impasse in global climate change policy. The book's primary goal is to explore new possible modes of governance and the need to change the modern mindset. ...a "must read" for all global policy makers who are involved with setting in place a new Climate Change Protocol and everyone else who cares about the future of our planet." "The issue of global climate change challenges us scientifically, technically, and economically. But perhaps more than anything, it challenges us ethically. It forces us to confront the thought that the world we have created is perhaps not worthy of us as moral beings. Such insight creates crisis: how could we act differently? How could we be better, more just, wiser, and more prudent? Environmental ethics offers a critically important tool to reconceptualize our ideas about what it means to be a human, what it means to act justly and rightly, and what it means to be a person of dignity and grace in the world today. The important and thoughtful essays in Ved Nanda's Climate Change and Environmental Ethics are precisely the kind of reconceptualizing we so desperately need."